Olivier Giroud’s first goal of the season helped Chelsea into the last 32 of the Europa League as they edged to victory over Bate Borisov. Chelsea are now six points clear of Hungarian side MOL Vidi, who moved up to second in the group with a win over PAOK Salonika. That prompted a strong response from Bate who created a glut of chances to level. But Nikolai Signevich struck the left post, Aleksey Rios blazed over and Baga again hit the post from close range as the Blues held on to win. Despite France’s exploits in winning the World Cup in Russia in the summer, it was hardly a vintage tournament for Giroud who ended it without registering a single shot on target in 546 minutes of action. And the prospects of an early-season pick-me-up were hardly assisted by his late return to training six days before the Premier League campaign started. As a consequence, the 32-year-old has struggled for sharpness and to integrate into a style of play that is evolving under Sarri. However, in his 12th match of the campaign and 794 minutes from his last goal in Chelsea colours, against Liverpool on 6 May, Giroud made a decisive contribution. Tellingly, the 6ft 3in forward delivered it with a textbook downward header from Emerson’s pinpoint left-wing cross to underline the value his aerial prowess offers in tight games. While Sarri made seven alterations to the Chelsea team that defeated Crystal Palace 3-1 on Sunday, Eden Hazard was his most notable inclusion. The Belgium international had missed three matches with a back problem before being introduced from the bench against Palace. And this appeared the perfect opportunity for Sarri to give Hazard a match-sharpening run-out ahead of their weekend fixture against Everton. The 27-year-old, making his first start in the competition, was given just over an hour and, in truth, struggled, perhaps justifying Sarri’s desire to put more minutes into his legs. Though Chelsea enjoyed almost 74% of possession, Hazard was largely anonymous, making 46 passes and touching the ball 65 times before he was withdrawn. Bate have lost on each of the three occasions they have hosted an English side in Europe (also 1-2 vs Everton in Oct 2009 and 2-4 vs Arsenal in Sep 2017). Chelsea have won four consecutive games in European competition for the first time since April 2012, when they went on to win the Champions League. Sarri has won all 10 of his Europa League group-stage games as a manager, with his sides scoring 28 goals while conceding just four in return. 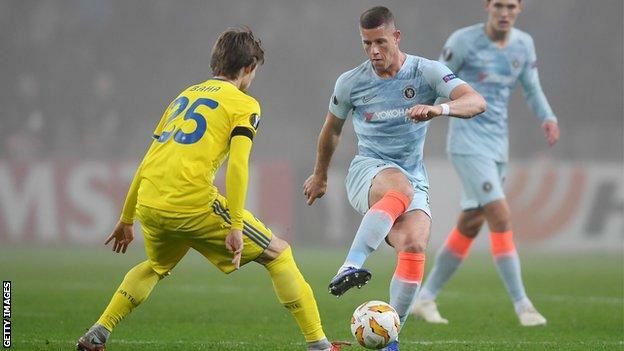 Three Englishmen started for Chelsea against Bate (Ross Barkley, Gary Cahill, Ruben Loftus-Cheek), the most for the Blues in European competition since April 2014 vs Atletico Madrid (Gary Cahill, Ashley Cole, John Terry). Giroud scored his first goal for Chelsea since netting against Liverpool in May – he had gone 14 games, 793 minutes and 24 shots without scoring. Chelsea return to domestic action on Sunday 11 November when they host Everton in the Premier League (14:15 GMT). The Blues host PAOK Salonika in their next Europa League fixture on Thursday 29 November (20:00 GMT). Match ends, BATE Borisov 0, Chelsea 1. Second Half ends, BATE Borisov 0, Chelsea 1. Attempt blocked. Evgeni Berezkin (BATE Borisov) left footed shot from outside the box is blocked. Corner, BATE Borisov. Conceded by Gary Cahill. Zakhar Volkov (BATE Borisov) hits the right post with a right footed shot from outside the box following a corner. Corner, BATE Borisov. Conceded by Emerson. Attempt missed. Olivier Giroud (Chelsea) left footed shot from very close range is close, but misses to the right. Assisted by Willian with a cross following a corner. Attempt blocked. Willian (Chelsea) right footed shot from the right side of the box is blocked. Assisted by Callum Hudson-Odoi. Offside, BATE Borisov. Jasse Tuominen tries a through ball, but Hervaine Moukam is caught offside. Attempt missed. Evgeni Berezkin (BATE Borisov) right footed shot from outside the box misses to the right. Hervaine Moukam (BATE Borisov) wins a free kick on the right wing. Attempt blocked. Pedro (Chelsea) right footed shot from the left side of the box is blocked. Assisted by Olivier Giroud. Jorginho (Chelsea) wins a free kick in the defensive half. Foul by Evgeni Berezkin (BATE Borisov). Substitution, BATE Borisov. Evgeni Berezkin replaces Alyaksandr Hleb. Olivier Giroud (Chelsea) wins a free kick in the defensive half. Foul by Zakhar Volkov (BATE Borisov). Substitution, BATE Borisov. Hervaine Moukam replaces Maksim Skavysh. Attempt missed. Jorginho (Chelsea) right footed shot from outside the box is too high. Nikolai Signevich (BATE Borisov) wins a free kick on the right wing. Attempt missed. Ross Barkley (Chelsea) right footed shot from outside the box is too high. Assisted by Emerson. Attempt missed. Olivier Giroud (Chelsea) header from the centre of the box misses to the right. Assisted by Pedro with a cross following a corner. Corner, Chelsea. Conceded by Denis Scherbitski. Attempt saved. Olivier Giroud (Chelsea) header from the centre of the box is saved in the top centre of the goal. Assisted by Pedro with a cross. Attempt saved. Ross Barkley (Chelsea) left footed shot from outside the box is saved in the bottom right corner. Attempt saved. Eden Hazard (Chelsea) right footed shot from the left side of the box is saved in the bottom left corner. Assisted by Davide Zappacosta. Attempt missed. Aleksey Rios (BATE Borisov) right footed shot from the centre of the box is too high. Assisted by Nikolai Signevich. Nikolai Signevich (BATE Borisov) hits the bar with a right footed shot from the centre of the box. Assisted by Stanislav Dragun.